The Angola is on Sale! | Was $83,432 | NOW: $64,337! 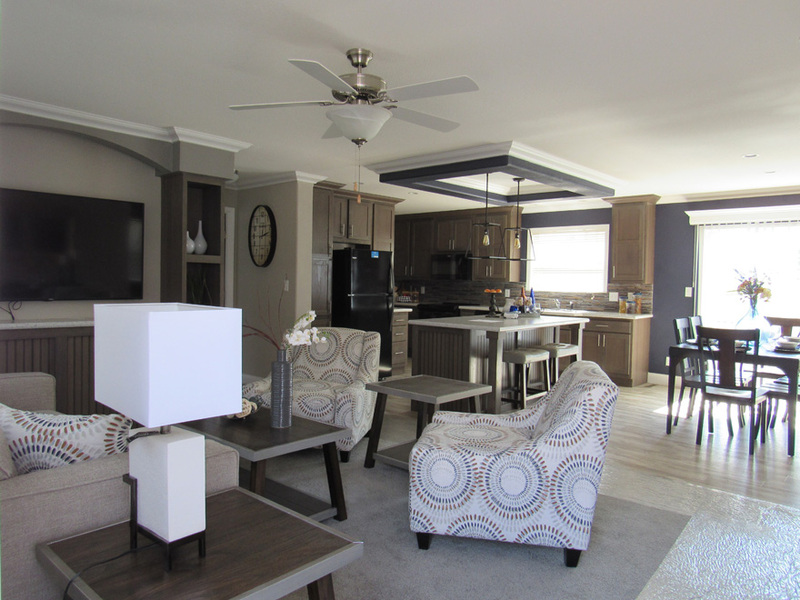 The Angola model has 3 Beds and 2 Baths. 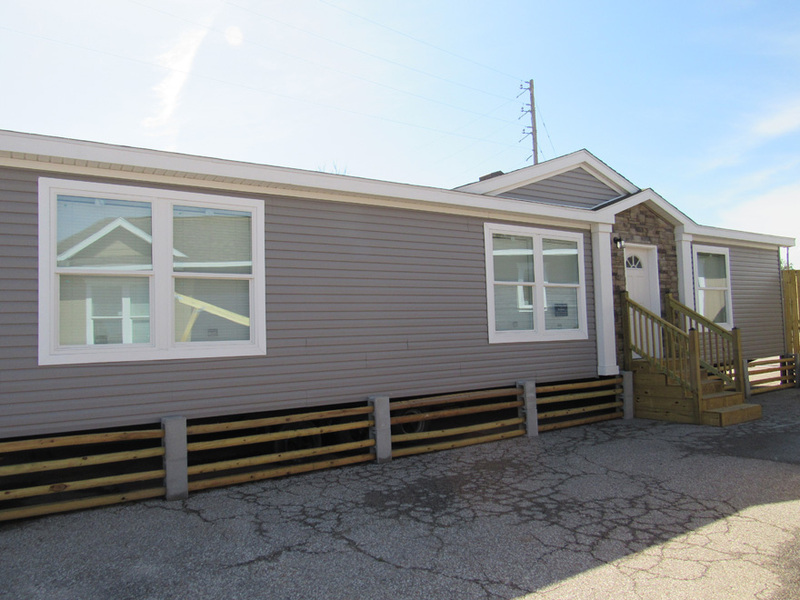 This 1369 square foot Double Wide home is available for delivery in Kansas, Missouri, Oklahoma, Arkansas & Colorado. 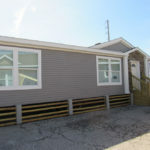 On the hunt for a unique double wide? The well-equipped Angola model might be just exactly what you’re looking for. The beautiful kitchen includes a multi-functional desk, raised snack bar, detailed wood cabinetry and an impressive walk-in pantry. The optional den would be an excellent addition to the home. Front elevation with horizontal Greystone vinyl siding with White trim. Low E white vinyl windows. Black exterior carriage light. Options shown: New Stone on entry way. Double dormers and 12 inch White columns. 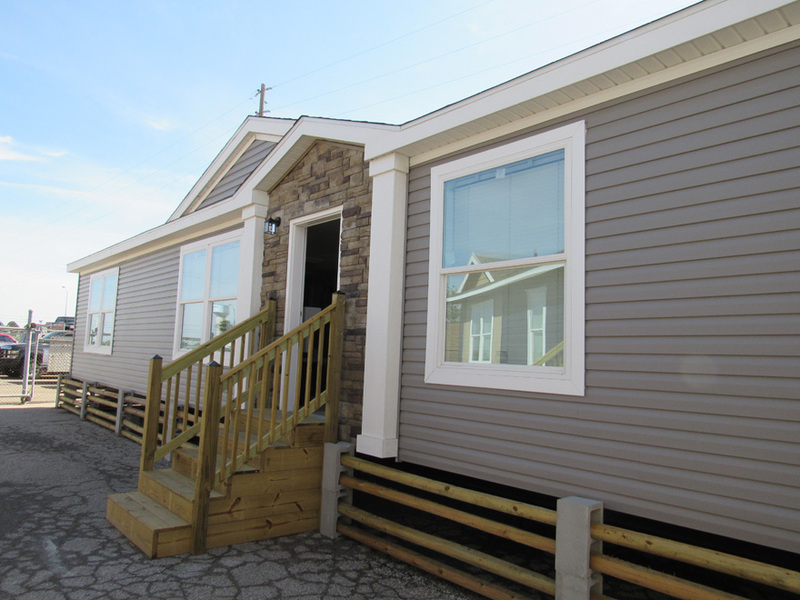 Front elevations with horizontal Greystone vinyl siding. White trim and Low E vinyl windows. 36″ white Sunburst front door. Black exterior carriage light. Options shown: New Stone on entry way. Double dormers with 12 inch White columns. 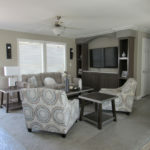 Living area- Mantra deep cut pile carpet in Rock Ridge color. Linoleum flooring in Glacier color. Hardwood Timberwolf cabinet entertainment center. Hardwood Timberwolf flat panel cabinets in kitchen area with Leche Vesta countertops. White 5 1/4″ cove trim and white 5 1/4″ base trim in tape and textured areas . Hardwood Timberwolf entertainment island with Leche Vesta countertop. Crown molding at kitchen cabinets. Low E white vinyl windows with 1 1/2″ Kiriwood blinds. 52″ paddle ceiling fan. 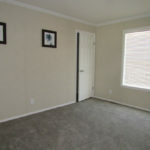 Tape and texture in living room painted Anew Gray and accent wall is painted Dovetail. 18 CU FT refridgerator in black. Nickel Cabinets and drawer pulls. Options shown: Tray ceiling with dropped soffit. 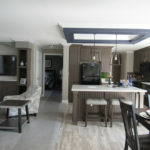 Kitchen accent wall and ceiling soffit is painted Charcoal Blue accent color. Black cage pendant lights. Can lights in kitchen and dining area. Sliding glass door with wood valance painted white in dining area. Black Appliance package includes microwave , dishwasher and smooth top front dial electric stove, and 18 Cu Ft. Refrigerator . Crescent edging on countertops throughout. Bump out sink. Full height Modulo stone backsplash in kitchen. All Furnature is shown for Display and may or may not be available for additional Cost. Living room – Mantra deep cut pile carpet in Rock Ridge color. Linoleum flooring in Glacier color. Hardwood Timberwolf cabinet entertainment center. Low E white vinyl windows with Kiriwood blinds. 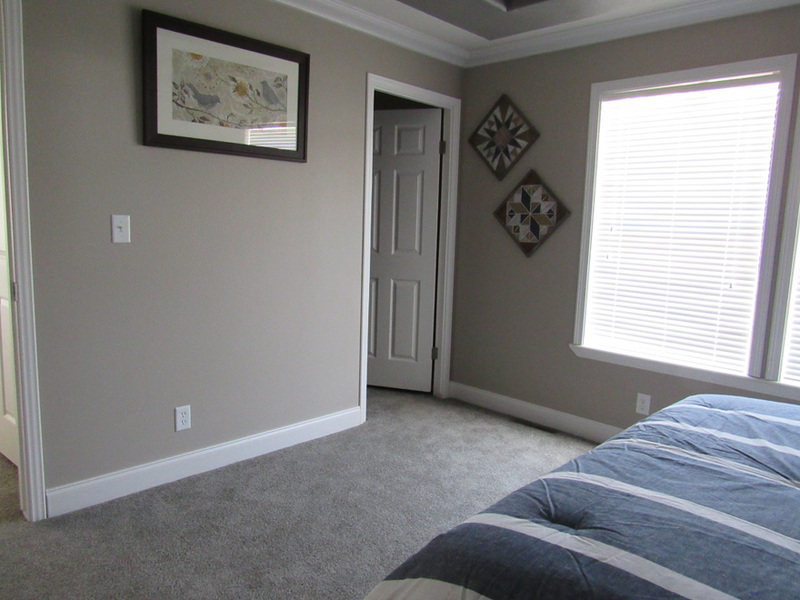 White 5 1/4″ cove trim and white 5 1/4″ base trim in with Tape and texture painted Anew Gray and accent wall is painted Dovetail. White deluxe door casing and White 6 panel interior door. 52″ paddle ceiling fan. Furnature is shown for Display and may or may not be available for additional Cost. Open living area – Mantra deep cut pile carpet in Rock Ridge color. Linoleum flooring in Glacier color. Hardwood Timberwolf cabinet entertainment center. Hardwood Timberwolf flat panel cabinets in kitchen area with Leche Vester countertops. 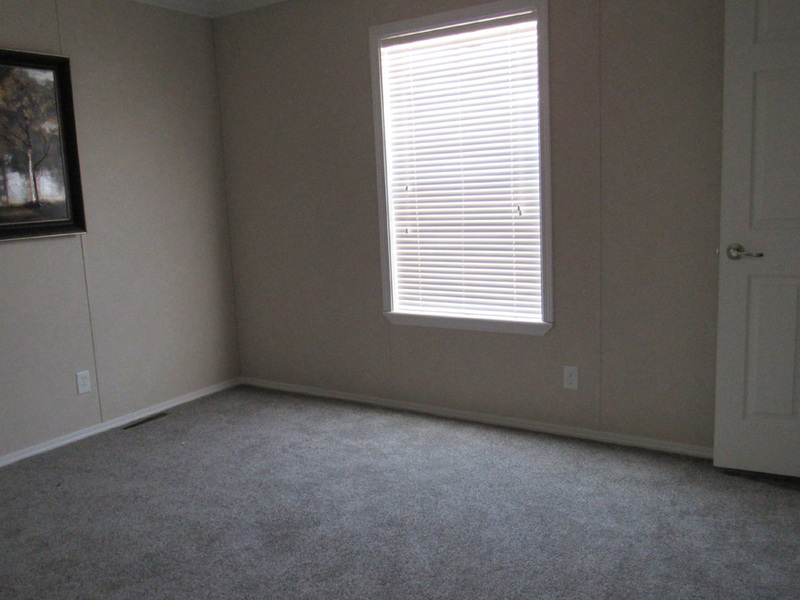 White 5 1/4″ cove trim and white 5 1/4″ base trim at tape and textured areas throughout with orange peel ceiling. Hardwood Timberwolf entertainment island with Leche Vesta countertop. Crown molding at kitchen cabinets. Low E white vinyl windows with Kiriwood blinds. Tape and texture in living room painted Anew Gray and accent wall is painted Dovetail. 18 CU FT refridgerator. Cabinets and drawer pulls. Options shown: Tray ceiling with dropped soffit. 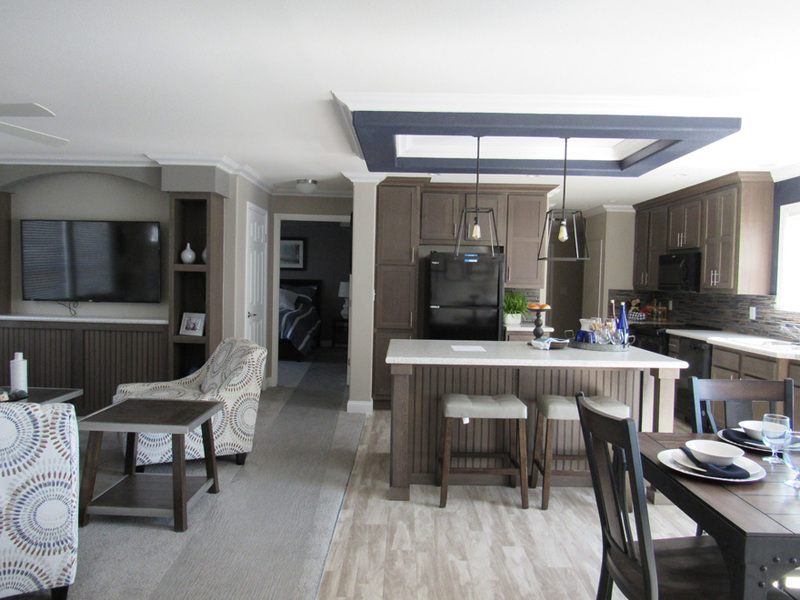 Kitchen accent wall and ceiling soffit is painted Charcoal Blue accent color. Black cage pendant lights. Can lights in kitchen area. Appliance package includes microwave and hood, dishwasher and smooth top front dial electric stove, all in black. Crescent edging on countertops throughout. Bump out sink. Full height Modulo stone backsplash in kitchen. Furnature is shown for Display and may or may not be available for additional Cost. 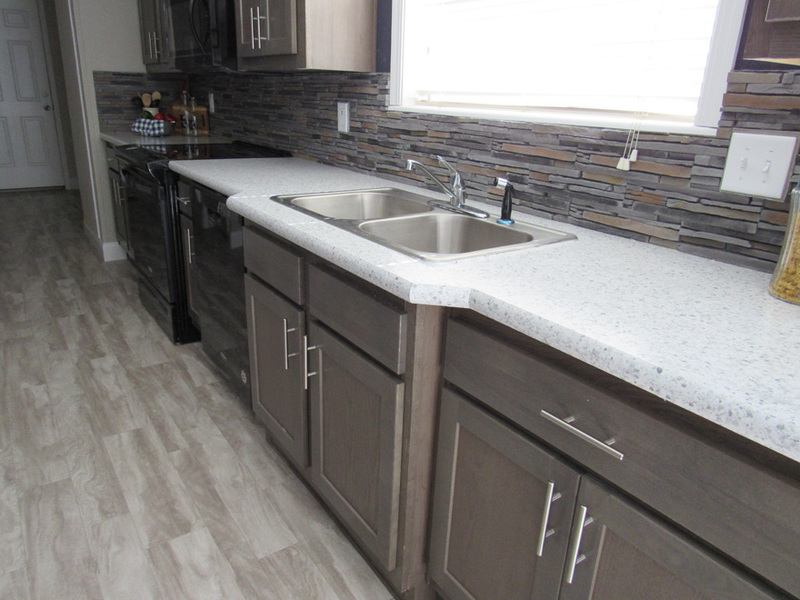 Kitchen – Linoleum flooring in Glacier color. 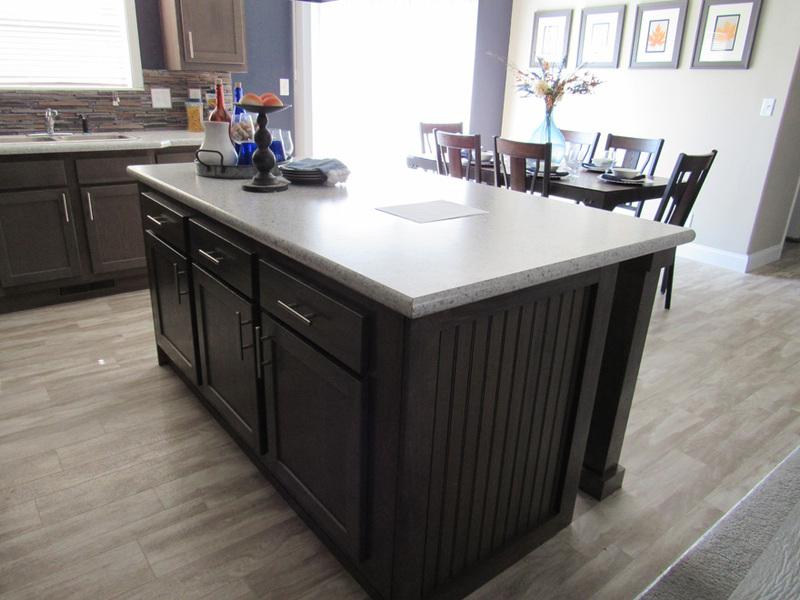 Hardwood Timberwolf flat panel cabinets with Leche Vesta countertops. Nickel Cabinets and drawer pulls. Stainless steel 8″ double bowl sink. Single lever faucet with sprayer. Low E white vinyl windows with Kiriwood blinds. 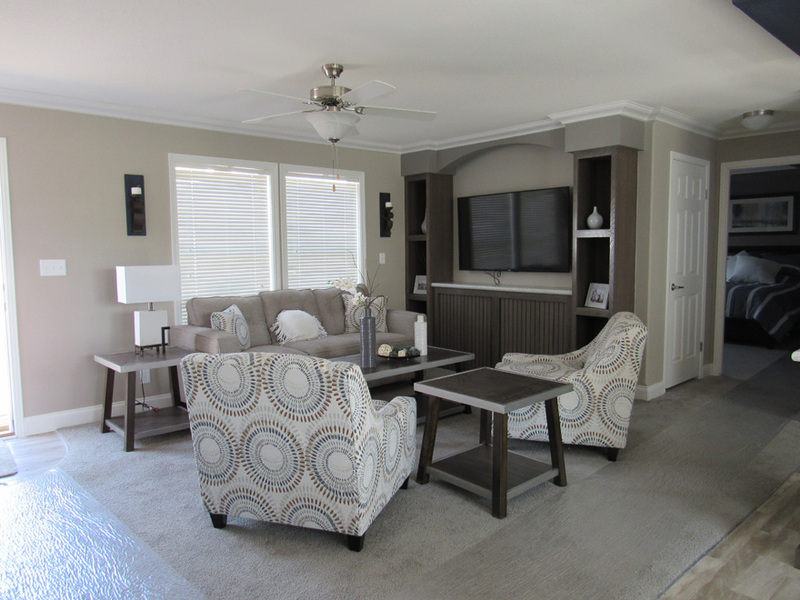 Tape and texture in living room painted Anew Gray with White 5 1/4″ base trim . White 6 panel interior door. Options shown: Smooth top Front dial electric stove and Microwave in black. Bump out sink in kitchen. Crescent edging on countertops throughout. Full height Modulo stone backsplash. 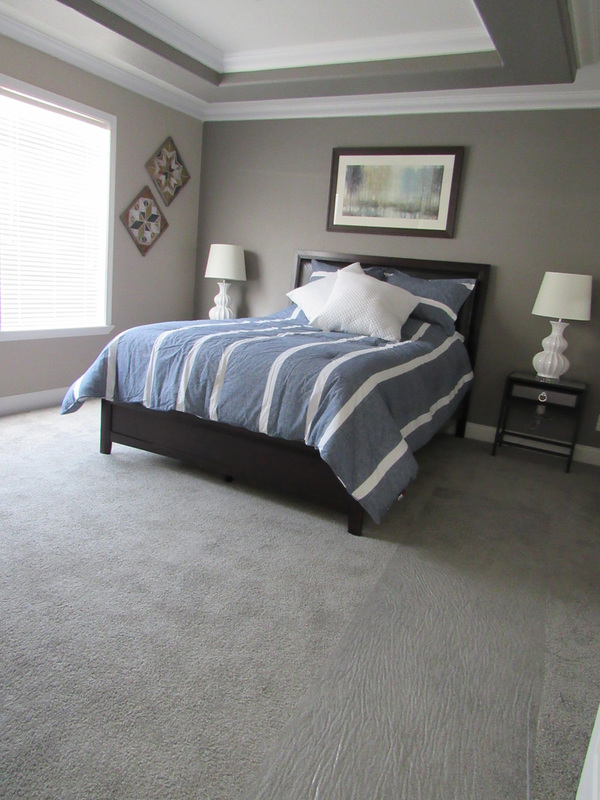 Bedroom – Mantra deep cut pile carpet in Rock Ridge color. Low E window with white 1 1/2″ Kiriwood blinds. Tape and texture painted Anew Gray. 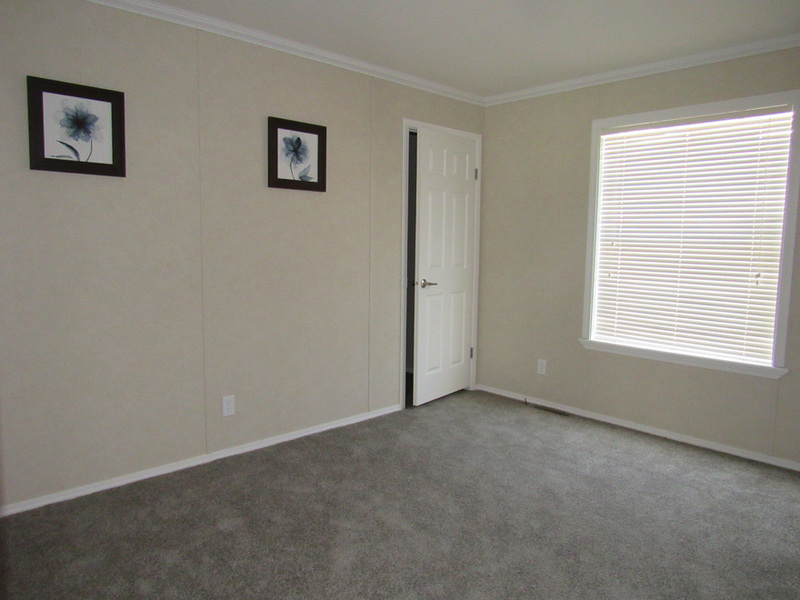 White 5 1/4″ cove trim and white 5 1/4″ base trim at tape and textured areas throughout with orange peel ceiling. Options shown: Ceiling soffit and the accent soffit is painted Dovetail.Furnature is shown for Display and may or may not be available for additional Cost. 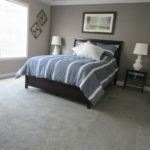 Bedroom – Mantra deep cut pile carpet in Rock Ridge color. 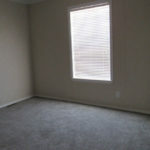 Low E window with white Kiriwood blinds. Tape and texture painted Anew Gray. White 5 1/4″ cove trim and white 5 1/4″ base trim . White 6 panel interior door. White deluxe door casing. Options shown: Ceiling soffit and the accent soffit is painted Dovetail. 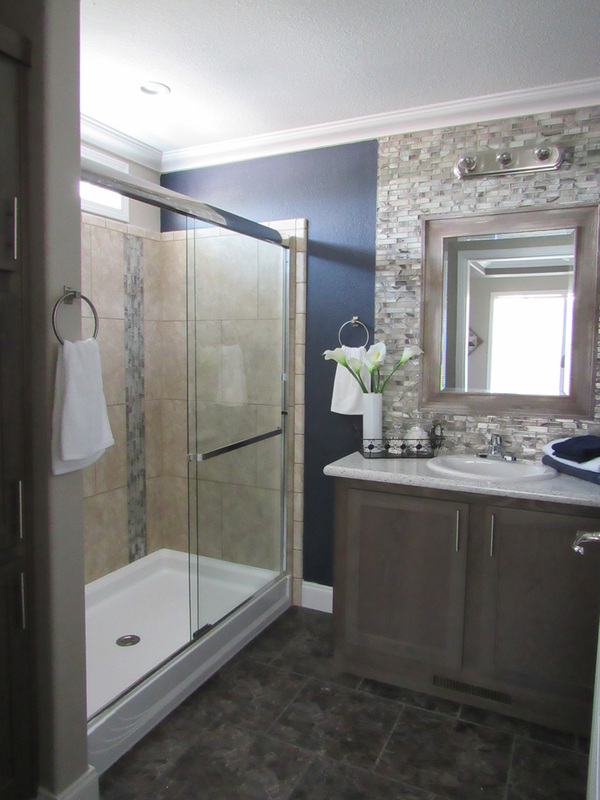 Bathroom – Hardwood Timberwolf flat panel cabinets with Leche Vesta countertop. Nickel Cabinet and drawer pulls. White 5 1/4″ cove trim and white 5 1/4″ base trim. Low E white vinyl window. 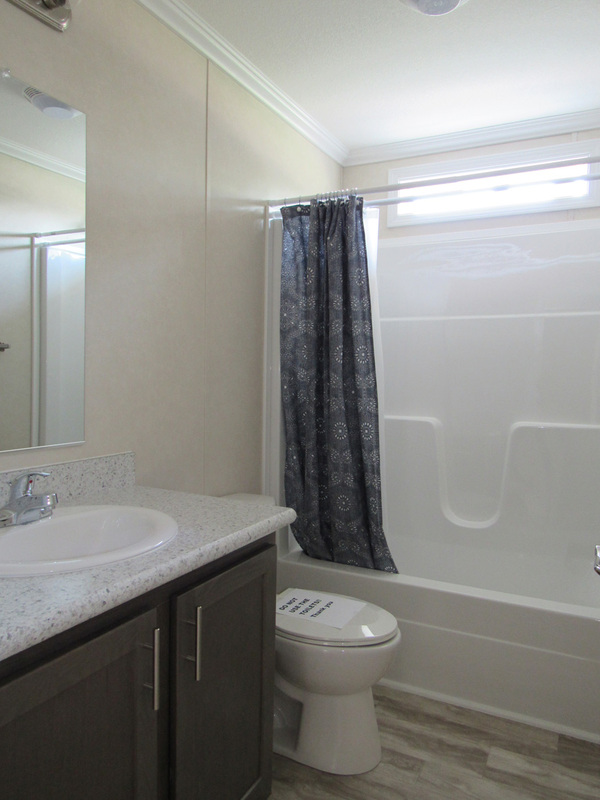 Options shown: 60″ ceramic shower with Fiberglass pan. 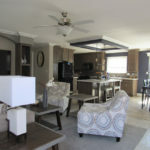 glass sliding doors and White Rock ceramic tiles with Jerald vertical tile accent. Mosaic tile backsplash to ceiling in Triton above sink. Crescent edging on countertops throughout. 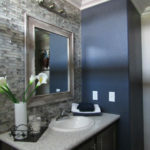 Accent wall painted Charcoal Blue color. Flooring is Elements floor tile in Sarhara color. Deluxe bathroom mirror trim. 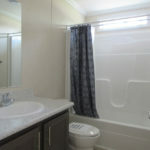 Bathroom – Hardwood Timberwolf flat panel cabinets with Leche Vesta countertop. Nickel Cabinet and drawer pulls. White 5 1/4″ cove trim and white 5 1/4″ base trim. Options shown: Mosaic tile backsplash to ceiling in Triton. 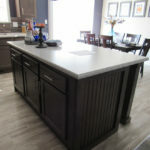 Crescent edging on countertops throughout. 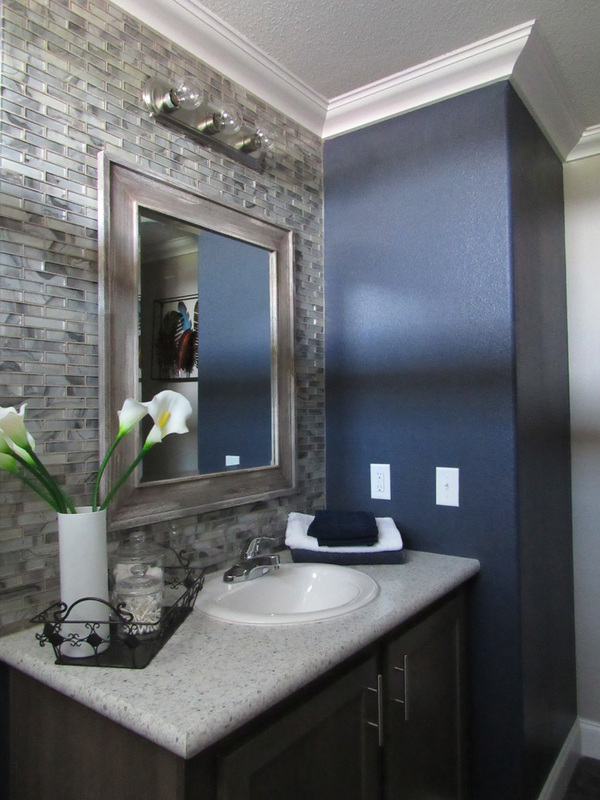 Accent wall painted Charcoal Blue color, and Deluxe bathroom mirror trim. 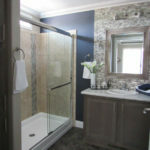 Bathroom – Zen vinyl on gypsum walls . white 3″ cove trim in . 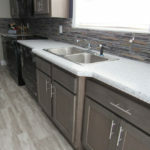 Hardwood Timberwolf flat panel cabinet with Leche Vesta countertop. Nickel Cabinet pulls. Linoleum flooring in Glacier color. 60″ 1 piece fiberglass bath and shower combo. 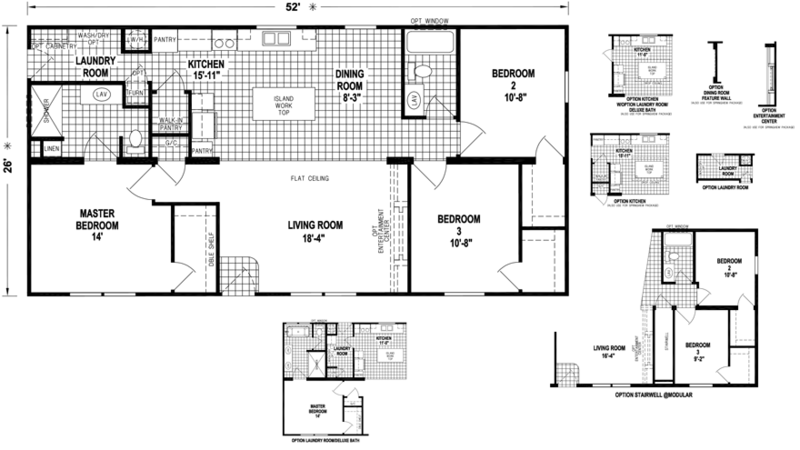 Options shown: 2 1/4″ base trim in white. 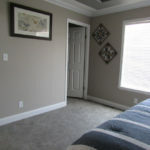 Bedroom – Zen vinyl on gypsum walls with orange peel ceiling. 3″ cove trim in white. Mantra deep cut pile carpet in rock Ridge color. Low E white vinyl windows with Kiriwood blinds. 6 panel white door. Options shown: 2 1/4″ base trim in white. 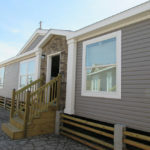 Ask your housing consultant about the other great features that come standard on the Angola manufactured home.